18th century Philadelphia was primarily a port city, its wealth based on imports and exports from all over the world. At the time of the American Revolution, the city’s major trading partners included the Spanish colonies of the Caribbean and South America. Spanish America sent sugar, molasses, coffee, and tobacco in return for flour, rum, and manufactured goods. But Philadelphia’s most important export may have been ideas about equality and independence. At 20th Street and the Ben Franklin Parkway there is a statue of a dashing soldier drawing his sword. This statue of Francisco de Miranda is a gift from Venezuela in recognition of the part Philadelphia played in Venezuela’s birth as a republic. Francisco de Miranda was born in Caracas, Venezuela in 1750 and at age 22 became a captain in the Spanish army, eventually commanding forces in support of the American Revolution. He turned against Spain and fled to the United States, resolving to free Venezuela from Spanish rule. He arrived in Philadelphia in 1783, a time when the American Philosophical Society held the world's largest collection of Spanish American works and was the first institution to have Spanish Americans as corresponding members. Miranda became friends with revolutionary leaders including Washington, Hamilton, and Paine and he regarded Philadelphia as the cradle of liberty. Miranda traveled to England, France, Greece, Turkey, and Russia, attempting to gain support for an independent South America in exchange for trade monopolies. 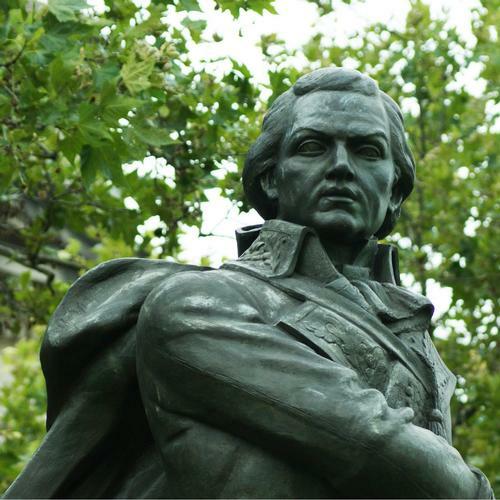 In 1792, he became a marshal in France’s revolutionary army and fought for the French Republic (his name is inscribed on the Arc de Tromphe.) In 1805, Miranda returned to New York and Philadelphia to gather volunteers and arms for an invasion of Venezuela, but the Spanish eventually repelled his attack. He returned to Venezuela in 1810 and was briefly successful, but he ended up in a Spanish prison where he died in 1816. Simon Bolivar eventually succeeded in liberating Venezuela in 1813. Manuel Torres(Manuel de Trujillo y Torres) was born in Spain in 1762 and in 1778 migrated to New Granada (now Colombia), where he became a prosperous planter. 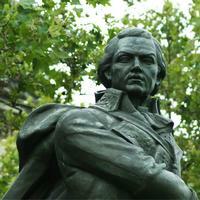 After taking part in a conspiracy to overthrow Spanish rule, he fled for his life and settled in Philadelphia in 1796. Torres quickly made friends with many political leaders, most notably William Duane, editor of Aurora, a popular newspaper. Duane published Torres’ articles making the case for Latin American independence as well as pamphlets and books on the subject. This led to Torres’ publication in New York, Baltimore, and Washington newspapers as well. Torres soon became a liaison between South American agents and North American merchants, bankers, and volunteers, and his home at 289 Spruce Street was a gathering place for Latin American exiles. 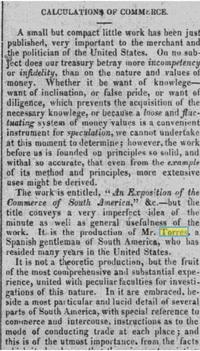 In 1810, Simon Bolivar sent his brother, Juan Vicente, to Philadelphia to buy arms for the impending invasion of Venezuela and Torres introduced him to Stephen Girard, who sold him arms. Girard later petitioned Secretary of State James Monroe to approve continued shipments of arms to Bolivar, but Monroe refused to reply. In 1818, Simon Bolivar, now president of the newly independent Venezuela, appointed Torres charge d’affaires of Venezuela. Later, Torres became the first official minister of Gran Columbia (now Venezuela, Colombia, Ecuador, and Panama). In 1822, his meeting with President Monroe became the first official recognition by the U.S. of an independent Latin American nation. Torres died in July, 1822. He was buried in Old St. Mary’s Church cemetery near 4th and Spruce Street with full military honors. 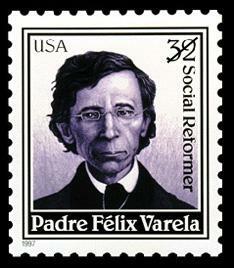 Father Felix Varela (Padre Felix Varela y Morales) was born in Havana, Cuba in 1788 and ordained as a priest in 1811. A fierce exponent of Cuban independence from Spain and the abolition of slavery, Varela emigrated to the U.S. and arrived in Philadelphia in 1823. Soon afterwards he wrote and published El Havanero, a journal that expressed his support for an independent Cuba and included such articles as Revolution involving a foreign army, Revolution accomplished without foreign aid and Love of Americans for independence. The journal was written entirely in Spanish and smuggled into Cuba, where it became a call for revolution. It was the first Spanish language publication written, printed, and published in the U.S. El Havanero ceased publication after six issues, but its influence in Cuba is still recognized and Varela has been referred to as "the first Cuban saint." After publishing the final issue of El Havanero, Varela returned to his roots as a priest. He moved to New York where he established a small church near the docks of lower Manhattan and devoted the rest of his life to helping Irish immigrants fleeing poverty. He died there in 1853 and was buried in St. Augustine, Florida. His remains were later exhumed and recommitted at the University of Havana. 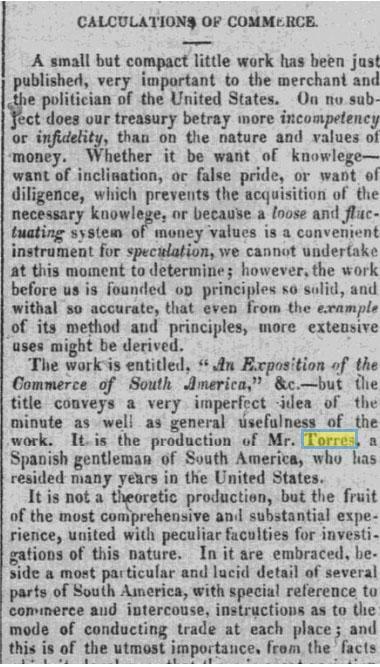 From Aurora, 4-30-1816: a review of Manuel Torres' pamphlet, "An Exposition of the Commerce of Spanish America"